Manchester United forward Anthony Martial has been named Premier League player of the month for September. 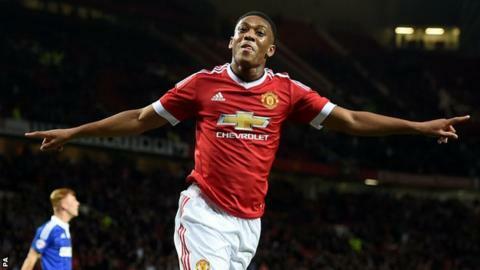 The 19-year-old has scored three goals in four league outings, including one on his debut against Liverpool. The France international became the world's most expensive teenage player when he signed from Monaco in September for £36m, which could rise to £58m. Mauricio Pochettino is the manager of the month courtesy of guiding Tottenham to three successive victories. This included a 4-1 win over last season's runners-up Manchester City at White Hart Lane. Martial scored eight goals in 31 Ligue 1 games last season for Monaco and made his international debut for France in a friendly against Portugal on 4 September.